Inductors can be found in many of the devices you use every day, but if you’ve been working only with DC in your projects there’s a good chance you’ve never needed to know anything about them. Now’s your chance to pick up on the basics with this video tutorial series. [Afroman] put together four short videos that we’ve embedded after the break. Set aside fifteen minutes to watch them; you’ll be glad you did. The first in the series starts out by explaining that an inductor is a coil of wire that serves a similar function as a capacitor with one major difference. A capacitor stores voltage, while an inductor stores current. In the second video, [Afroman] hooks up some inductors to a square-wave generator, then measures the resulting current characteristics using an oscilloscope. 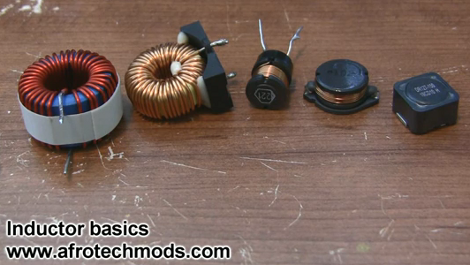 He shows the difference between inductor core material (air core versus ferrite core) and illustrates the properties that make inductors so useful as filters. The third video covers filtering circuits, and the fourth is the best explanation of why you need a flyback diode when driving a motor (an inductive load) that we’ve seen yet. [Moser’s] introductory guide to MOSFETs serves as a quick introduction for those unfamiliar with the parts. They fill a similar role as a bipolar junction transistor like the 2N2222, making it possible to switch large loads. But fundamentally they are different. Metal Oxide Field Effect Transistors have three pins for Drain, Source, and Gate instead of the Collector, Emitter, and Base that you may be used to. The Gate is the control pin for the device and offers a desirable advantage over bipolar junction transistors in that it is insulated from the channel. This means that much less current flows into the Gate when compared to the Base of a common transistor, saving power and providing protection to the logic circuitry. Don’t fret if this makes your head spin. [Moser’s] writeup is short and to-the-point but it’s not watered down. You can get a basic overview and if you care to learn more, he’s linked to datasheets and has basic terminology that is easily clarified with a Google search. One of the most powerful tools that he’s included is the simple MOSFET and driver circuit diagram you see above. This makes it possible to switch incredibly large loads very quickly; the true power of the MOSFET. Push-wheel switches are somewhat older technology, but [John Boxall] from the Little Bird Electronics blog shows us that they are still quite useful today. In a quick but thorough demonstration, he discusses how this input technology works, showing off both single digit and multi digit inputs. The former is pretty straightforward, with each of the counter’s outputs tied to an I/O pin on his Arduino. Using multiple counter units is ever so slightly more complicated, but the job is made easier through the use of an NXP 74HC4066 bilateral switch. He shares a snippet of Arduino code that toggles through each of the switches, reading in their values one by one. 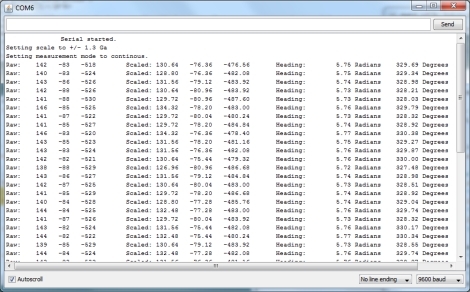 His walkthrough is a must-see for those who are just getting their feet wet with Arduinos and various input methods. These counters are great for 1-4 digit input needs, but if you require more digits [John] says that a 12-digit keypad would probably be a better way to go. Stick around to see a short video demo of the switches doing their thing. The folks over at LoveElectronics recently published an article that explains some of the ins and outs of magnetometers for those who are interested in trying one out, but might not understand how to use them. A good part of the article focuses specifically on how to manipulate the HMC5883L magnetometer from Honeywell, but a lot of the information can be applied to other makes/brands of compass sensors. They start out discussing in very basic terms how the compass works, then delve into some specifics on how to interface the chip with an Arduino, courtesy of a breakout board that they sell. The breakout board is actually quite simple, so any number of custom iterations could be built for your own testing purposes. They walk through the use of an HMC5883L-specific Arduino sketch they produced, making it easy for beginners to start getting useful data from the compass units. While a pre-made sketch might seem like a bit of a cop out, it at least gives the curious/motivated beginner a chance to look at some completed code in order to see how things work. If you are interested in cutting your teeth on some additional beginner concepts, check out these other how-to articles and tutorials. Need to switch something on or off using a microcontroller? Using a transistor is one of the best ways to do this, but how exactly do you design properly for transistor switching? [Ben Krasnow] put together a tutorial in which he does an excellent job of explaining the ins and outs of designing transistor control circuits. We’ve embedded his twenty-minute video after the break. In it he talks about the use of transistors, the difference between NPN and PNP transistors, and the design specifics you need to know when working with them. We think that beginners will find [Ben’s] demonstration of how to calculates Hfe, which is the base current necessary to fully switch the transistor. If this is gibberish to you, have no fear. [Ben’s] instruction is clear and easily understandable. The one thing we missed in the video is clarification about base current protection for PNP transistors. 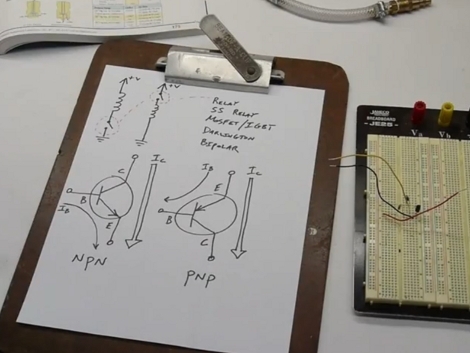 [Ben] mentions that there’s no easy circuitry that can be used on the base of a PNP to regulate flow from the emitter to the base, but he doesn’t elaborate. Otherwise, it’s everything we could have wanted on the topic. Adafruit has a new LED tutorial for people wanting to get started with electronics. It is full of useful diagrams, pictures, and quizzes to help make sure you are understanding the concepts. This is the real basic stuff here: LEDs, resistors, and the laws from Kirchhoff, and Ohm. It starts out explaining the parts of an LED. Then variations of LEDs: illumination versus indication, clear versus diffused, brightness, color, and size. 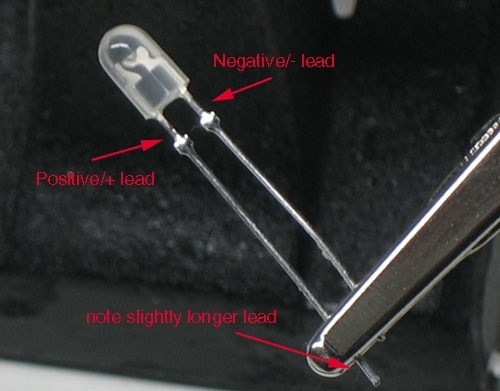 The mass of the tutorial covers how and why an LED’s brightness can be changed by a resistor and why a resistor is needed to keep an LED from burning out. Such as how Kirchhoff’s Voltage Law works with Ohm’s Law to help you determine the proper resistor for an LED. If you found useful the other beginner concepts posts about Analog Circuits and Electronics basics from the Giz, you should find this tutorial to be useful.